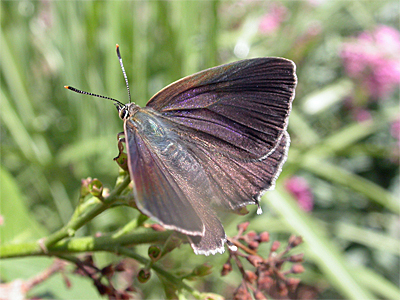 Since 1998 Purple Hairstreaks had been looked for in suitable habitat. Searches had been for both adults throughout the known flight season of July-August and again later as over-wintering eggs laid amongst the unopened buds of their chief foodplant - Oak (Quercus robur) This latter method is very often surprisingly more successful than one would perhaps expect. Yet all searches still failed to show any sign that the species was indeed present in the area until July 19th 2003, when a healthy colony was discovered at Lound Wood. The only aspect of this discovery which came as a surprise, was the fact that it took over five years to eventually locate the Purple Hairstreak butterfly in the area. We have found this species at many sites throughout Nottinghamshire and it is certainly under-recorded. We have also noted this habit being adopted by White-letter Hairstreak adults in Hare Hill Wood. 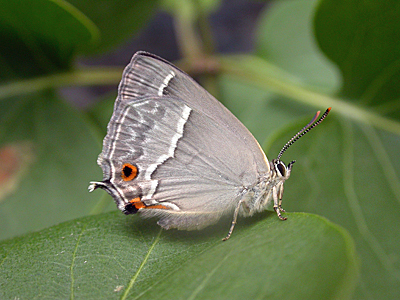 Their habit of frequenting the tops of mature Oaks, make recording this butterfly even more difficult, but adults are prone to vacating their favoured trees during the very hottest days and can be encountered in long grass, shadowed from the Sun's heat. This offers the only real chance of a close up view of the species and binoculars are required in order to observe them successfully. Flowers are rarely attractive to this butterfly. Look for sites where both Oak and Ash grow together as mature trees and stand and scan the tops for the adults. Egg-laying females often lay their eggs on lower branches of Oaks and can sometimes be observed at slightly closer quarters. Certainly the number of adults found at the Lound Wood site went into double-figures. This count coming after the inital sighting of a single male flying around both tree-types and then later coming to rest on it's favoured Ash leaf. Similarly to the White-letter Hairstreak, Purple Hairstreak males perch on favoured leaves and chase virtually any insect in their search for a female. They appear generally grey in flight and the purple found on the fore-wings of the male, will only be seen when perched with open wings. The photograph on the left, just about shows the purple sheen on the butterfly's upper forewing. Some adults show a stronger colouration than the individual pictured.